Interest rates, oil prices, housing declines and now international murder mysteries. The global markets declined on the potential impact of sanctions on Saudi Arabia and their claims of stronger retaliation if sanctions were imposed. The Saudi market fell 7% at the open on Sunday but recovered slightly to close with just under a 4% loss. The global markets declined on worries they would spike oil prices in retaliation. One commentary said "if you think $85 oil is bad wait until $100 or even $200 oil." Saudi could easily cause that to happen. With that backdrop the U.S. markets opened mixed and never managed to rebound much over the flat line. As the day drew to a close, sellers appeared and the big cap indexes declined to close near the lows for the day. After the bell news broke that Saudi Arabia was going to spin a story claiming the death was an accident that occurred during an interrogation by a rogue cell in the government. They will reportedly say that King Salman did not authorize it and had no knowledge and would take appropriate action on the perpetrators. The futures spiked to +11 on the news. Also complicating the day was a Goldman warning on slowing sales at Apple. The analyst said overall smartphone sales in China were declining rapidly and this would drag on Apple's earnings since 19% of sales came from China in the same quarter in 2017. Shares declined $4.75 to erase 32 Dow points and 20 Nasdaq points. Comments out of China that the US negotiating team was very confusing to deal with suggested little progress in the trade talks. That also weighed on the markets. 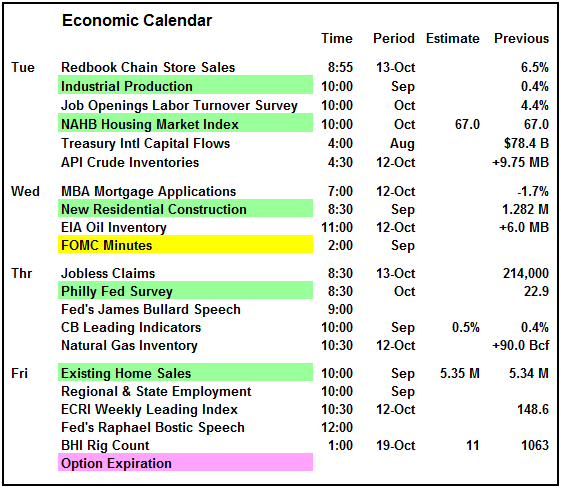 The economic calendar for Tuesday is led by the NAHB Housing Market Index and industrial production. The housing index could depress the market if it weakened significantly. The big event for the week is the FOMC minutes on Wednesday. As always, the focus on interest rate hikes will be the key. The Q3 earnings cycle accelerates on Tuesday with Goldman, IBM and Netflix leading the pack. 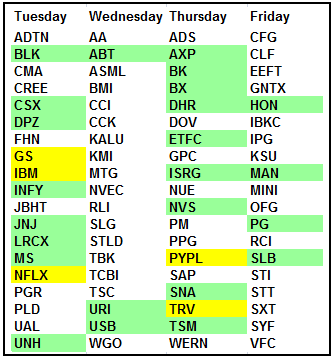 This is an interesting mix of companies this week. 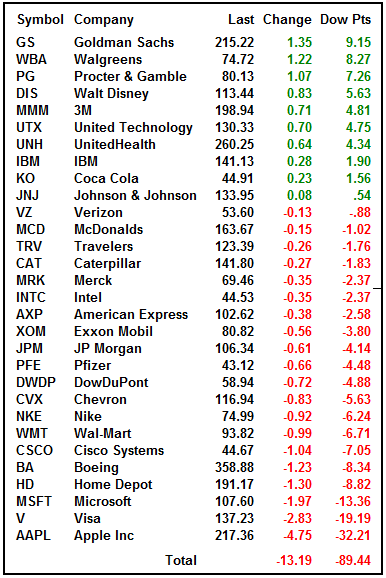 Coming up in the following week will be dozens of big cap techs and Dow components. This week is just the pre-show. The S&P gave back much of Friday's gains thanks to the big cap tech stocks. Amazon, the Google twins, Nvidia, Adobe and Netflix all posted strong losses and all are S&P 500 stocks. The index is holding on the wrong side of the 200-day and we need a strong opening pop on Tuesday to get us back on the positive side. 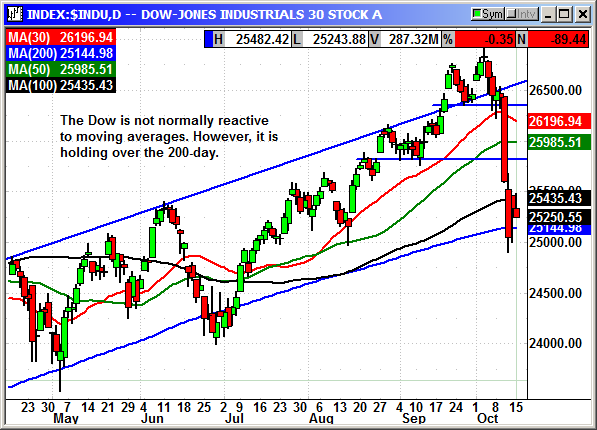 The Dow has found resistance at 25,500 for the last three days but also support at 25,000. 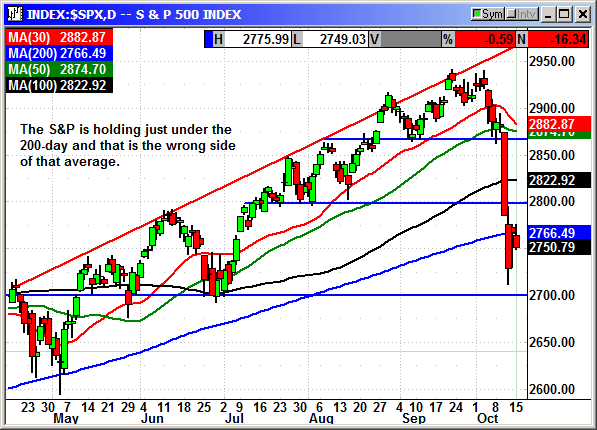 The index is also holding over the 200-day despite not normally being reactive to moving averages. The Dow was handicapped by Apple and Visa and the A/D line was in favor of the decliners. 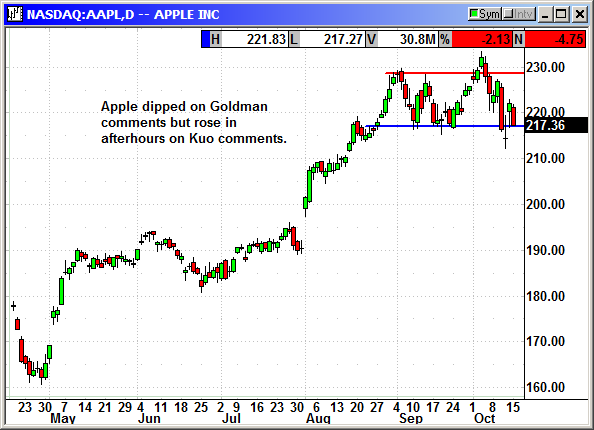 If Apple rebounds on Tuesday, it would help significantly. It was a negative day for big cap techs and there is no other way to describe it. The biggest of the big caps suffered the most losses. 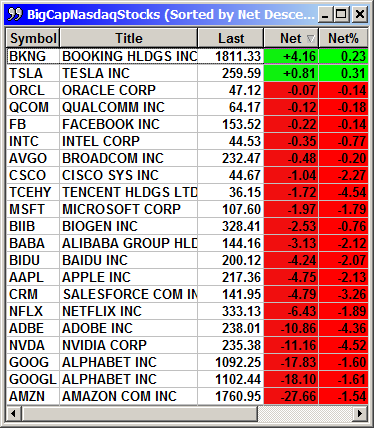 This was a major drag on the Nasdaq indexes even though advancers outweighed decliners 4:3 on the tech index. If the generals are declining the Nasdaq will decline. 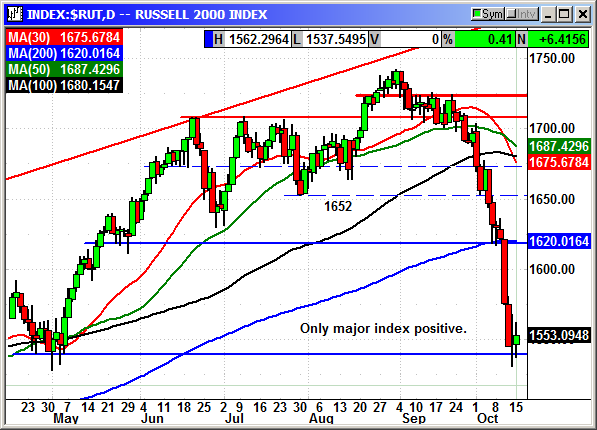 The Russell 2000 was the only major index to post a gain. It was not big but it was positive. This was sector rotation back out of large caps with international exposure and into domestic focused small caps and implied safety from geopolitical events in Saudi Arabia. On a technical basis, I am neutral. 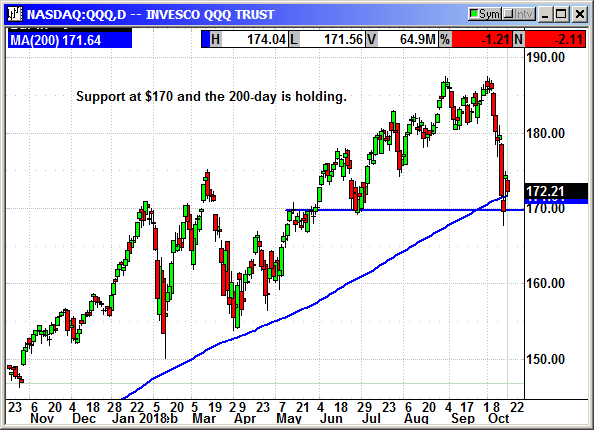 I would gladly be a buyer if the Russell 1000 ($RUI) retested support at 1,500 but otherwise there is nothing really supporting the broader market at this level. On a sentiment basis, I am somewhat bullish. We had the big drop, sellers are exhausted, earnings are now in progress and the economy remains very strong. High interest rates are overrated. I would not back up the truck but I would nibble on your favorite stocks. I added Apple in a similar position in the LEAPS newsletter on Sunday with June strikes. I looked at several hundred other stocks on Monday and this one was still my favorite for risk/reward. Buy Jan $230 call, currently $6.70, stop loss $211.85. Optional: sell short Jan $190 put, currently $3.30, stop loss $211.85. Buy Jan $285 call, currently $3.83, no initial stop loss due to market volatility. 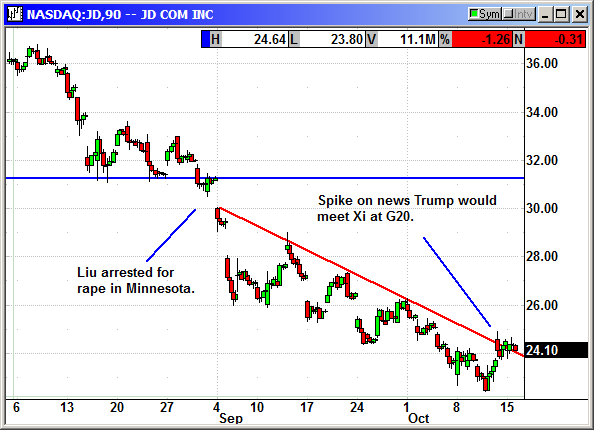 The long position was entered on Tuesday then stopped at $242.50. The short position was stopped at $24.55. 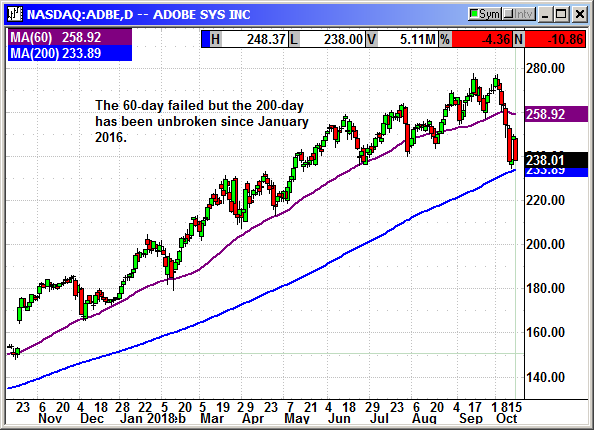 Adobe crashed with the market to test the 200-day average, which has been support since January 2016. Today, after high dollar Nasdaq growth stocks were downgraded, the stock declined $11 in regular trading. After the close Adobe affirmed its previously rosy outlook and even increased guidance. Shares rallied $14 in afterhours and will probably rally more on Tuesday. Unfortunately, we were stopped out on Wednesday's market drop. Original Trade Description: Oct 8th. Adobe Systems Incorporated operates as a diversified software company worldwide. Its Digital Media segment provides tools and solutions that enable individuals, small and medium businesses, and enterprises to create, publish, promote, and monetize their digital content. Its flagship product is Creative Cloud, a subscription service that allows customers to download and install the latest versions of its creative products. This segment serves traditional content creators, Web application developers, and digital media professionals, as well as their management in marketing departments and agencies, companies, and publishers. The company's Digital Marketing segment offers solutions for how digital advertising and marketing are created, managed, executed, measured, and optimized. This segment provides analytics, social marketing, targeting, media optimization, digital experience management, cross-channel campaign management, audience management, and video delivery and monetization solutions to digital marketers, advertisers, publishers, merchandisers, Web analysts, chief marketing officers, chief information officers, and chief revenue officers. Its Print and Publishing segment offers products and services, such as e-learning solutions, technical document publishing, Web application development, and high-end printing, as well as publishing needs of technical and business, and original equipment manufacturers (OEMs) printing businesses. The company markets and licenses its products and services directly to enterprise customers through its sales force, as well as to end-users through app stores and through its Website at adobe.com. It also distributes products and services through a network of distributors, value-added resellers, systems integrators, independent software vendors, retailers, and OEMs. The company was founded in 1982 and is headquartered in San Jose, California. Company description from FinViz.com. Adobe reported a 57.3% increase in earnings to $1.73 in the recent quarter. That was above their own guidance for $1.68. Revenue was $2.29 billion and also beat guidance for $2.24 billion. Digital media segment revenue rose 21% to $1.61 billion. Annually recurring revenue rose $339 million to $6.4 billion. Some 90% of Adobe's revenue came from recurring sources. Deferred revenue rose 23% to $2.71 billion. They guided for the current quarter for 22% revenue growth to $2.42 billion and $1.87 in earnings. Both numbers were slightly ahead of Wall Street estimates. Adobe has a fantastic chart with a steady incline and routine declines for profit taking. The 60-day average has been normal support. However, in the extreme bouts of profit taking the 100-day average has been support since December 2016. The stock penetrated that average intraday on Monday but rebounded to close above it. I believe this is a buying opportunity considering it was setting new highs last week. Unfortunately, premiums are expensive so we need to make this a spread. We are going to use the December options to maintain that earnings expectation premium but we will not hold over the report. Closed 10/15: Long Dec $265 call @ $9.18, exit $6.35, -2.83 loss. Closed 10/15: Short Dec $285 call @ $4.18, exit $2.39, +1.79 gain. 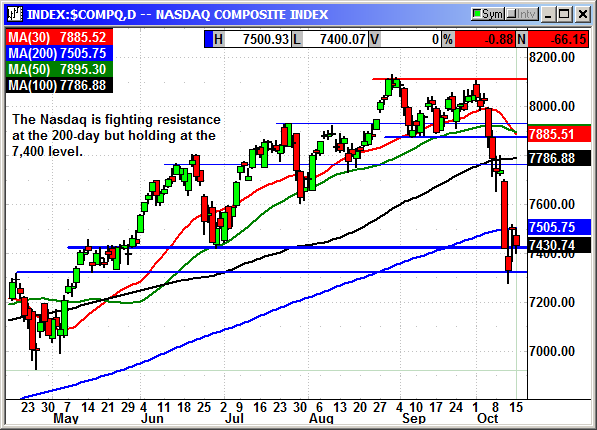 The Nasdaq 100 Index posted a sharp decline last week and briefly hit correction territory. 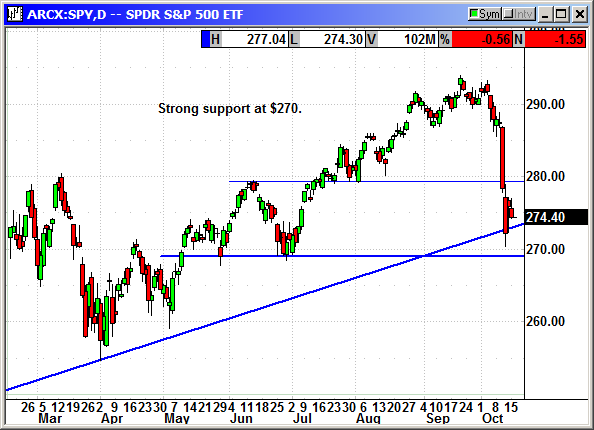 The 200-day at 7,041 was broken on Thursday but recovered on Friday. I considered recommending adding a couple additional contracts to this position with the close today at 84 cents. 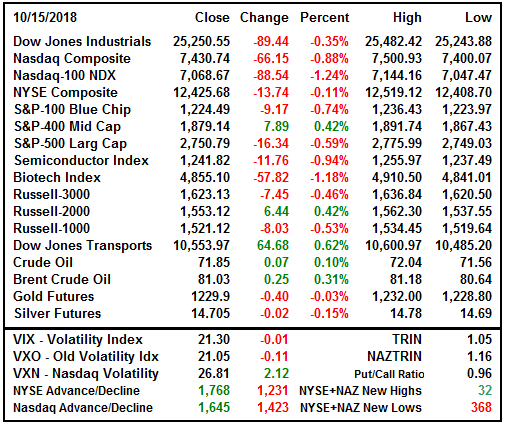 However, the Nasdaq was the weakest index today and I think I will wait until we have a confirmed rebound of more than one day to add to the position. No specific news. 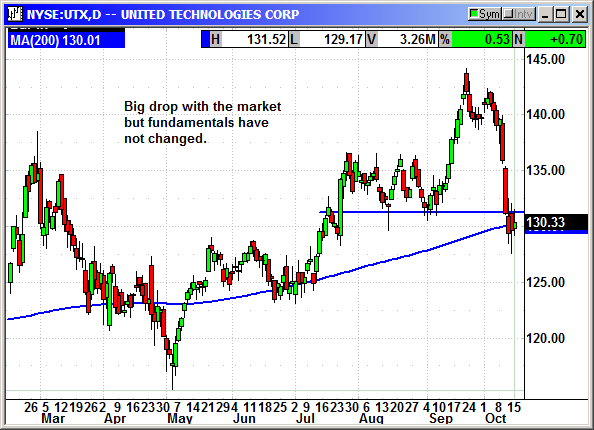 United has been riding the Dow roller coaster and is holding at the 200-day average. Earnings are next Tuesday before the open. I am recommending we close the position at the open on Monday. Original Trade Description: Oct 1st. United Technologies Corporation provides technology products and services to building systems and aerospace industries worldwide. Its Otis segment designs, manufactures, sells, and installs passenger and freight elevators, escalators, and moving walkways; and offers modernization products to upgrade elevators and escalators, as well as maintenance and repair services. The company's UTC Climate, Controls & Security segment provides heating, ventilating, air conditioning, refrigeration, fire, security, and building automation products, solutions, and services for residential, commercial, industrial, and transportation applications. This segment also offers building services, including audit, design, installation, system integration, repair, maintenance, monitoring, and inspection services. Its Pratt & Whitney segment supplies aircraft engines for commercial, military, business jet, and general aviation markets; and provides aftermarket maintenance, repair, and overhaul, as well as fleet management services. The company's UTC Aerospace Systems segment provides electric power generation, power management, and distribution systems; air data and aircraft sensing systems; engine control, intelligence, surveillance, and reconnaissance systems; engine components; environmental control systems; fire and ice detection, and protection systems; propeller systems; engine nacelle systems; aircraft lighting and seating, and cargo systems; actuation and landing systems; space products and subsystems; and aftermarket services. United Technologies Corporation offers its services through manufacturers' representatives, distributors, wholesalers, dealers, retail outlets, and sales representatives, as well as directly to customers. United Technologies Corporation was founded in 1934 and is headquartered in Farmington, Connecticut. Company description from FinViz.com. UTX is acquiring Rockwell Collins (ROK). An analyst at Morgan Stanley said the acquisition of Rockwell Collins is proceeding and should close in Q3. The acquisition increases the potential for restructuring and the potential spin off of non-core assets in order to concentrate on the profitable divisions. The analyst believes Rockwell Collins will help lift earnings to $7.60 in 2019 and $8.20 in 2020. The stock was resumed at Morgan Stanley with an overweight rating and $160 price target. Barclays has an overweight rating and $157 price target. Last week the company received approval for the Rockwell deal from the Justice Dept but they have to sell two Rockwell businesses. One of them sells de-icer systems and the other sells horizontal stabilizer actuators. The EU approved the deal in May. The last approval needed is from China and that could drag on given the tensions between the U.S. and China. They already killed the Qualcomm/NXP Semiconductor deal through a lack of action. UTX recently won a $2 billion deal for the propulsion systems on the F-35 joint strike fighter. This is the 11th award and will support all three variants of the fighter. The award is for 135 engines, production support, program management, engineering support, spare modules and spare parts. This contract is expected to reduce the price of the engines by as much as 3.39% compared to the 10th award. In Q1 United's revenue rose 18% on the commercial segment and 13% on the military segment. For Q2, UTX reported earnings of $1.97 that beat estimates of $1.86. Revenue rose 9% to $16.71 billion and beat estimates for $16.27 billion. They raised their full year guidance from $6.95-$7.15 to $7.10-$7.25. They raised revenue guidance from $64.0-$64.5 billion to $63.5-$64.5 billion. On September 21st, UTX said it was going to acquire S2 Security for $2.48 billion. The company is based in Massachusetts and manufacturers IP-based physical security and video management systems for healthcare, education and manufacturing companies around the world. UTX already has a portfolio of security offerings and this will enhance that business. Shares declined on the news and traded sideways for a week. There was a minor bump on Monday on the Canadian trade deal. I believe UTX is about to move higher to make new highs after the consolidation. With earnings only three weeks away we will decide a couple days before whether to hold over or not. Long Dec $145 call @ $3.55, see portfolio graphic for stop loss. Chinese stocks spiked on Friday when news broke that Trump was going to meet with President Xi at the G20 meeting. We were stopped on the spike. Original Trade Description: Sept 24th. Closed 10/12: Long Jan $23 put @ $1.49, exit $1.56, +0.07 gain. 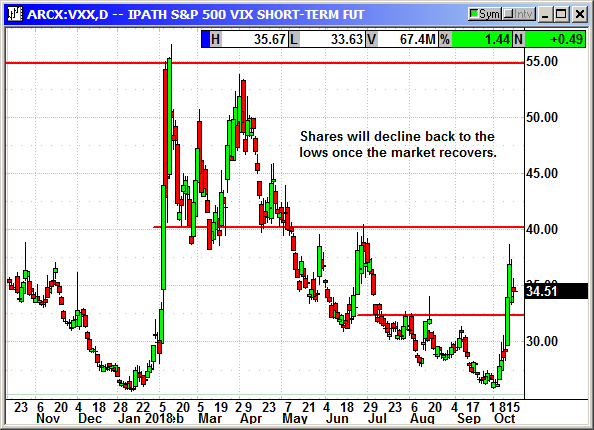 Last Monday the VXX was near historic lows at 26 and now we are 9 points higher. This is temporary. The VXX always goes back to single digits when the market is in rally mode.